Husom & Rose Photographics is a premier provider of restoration services for photographs, documents, handwritten books and historic paper items. We use both digital and traditional means to copy damaged, rare and fragile items. With over 20 years experience using the most advanced computer technology, we can restore, enhance and correct images and documents. In fact, we have done a number of restorations that others have said could not be fixed. 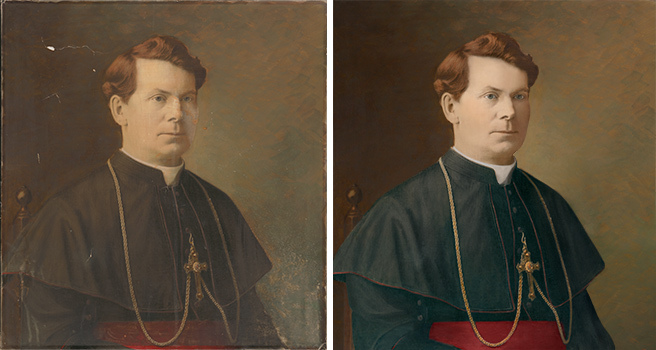 Restoration of Hand Colored 24X27 inch Photograph. Our archival printers can match the original tones of any black and white paper or produce the full color of color photographs or historic hand colored photos. Prints can be snapshot sized or large mural size enlargements. We also provide digital archiving of images, books and documents on DVDs and CD-ROMs and can help with framing and archival storage material of the original photograph or document. BEWARE: Many photo restoration providers on the Internet and from retail stores send your valuable photographs or documents to outside vendors in South America or India. In other cases, drug stores, camera stores and shopping mall restoration providers often will scan your work on an inexpensive flatbed scanner in the store and send just the digital file. Although this may sound safer, the problem is most of these stores do not have scanners of the necessary quality to get professional results. In other words, if they are sending out the restoration to a wholesale retoucher, they lack the skills to do the work themselves. All Work Done In-House and Safely! We do all scanning, restoration and printing within the safety of our own studio using professional photo lab scanners and professional archival printers. Don't settle for drug store quality restoration when for a few dollars more you can get museum quality and archival prints. We are located in Pierce County in Western Wisconsin on the East Bank of the Mississippi River overlooking Red Wing Minnesota. We work directly with customers from Red Wing, Ellsworth, Hudson, River Falls, Stockholm, Pepin and the Minneapolis - St. Paul - Bloomington areas in our studio. We are less than an hour from the Twin Cities and Rochester. We are also an easy drive from much of Greater Minnesota and Western and Northern Wisconsin. In addition we receive work from all across the country. We are experts and handling and packing valuable material. Call us at at: 715.792.5556 or you can e-mail us at: info@husomandrose.com for more information. When we received this print it looked like a box of puzzle pieces. The turn of the century hand colored photograph had fallen on the floor in a glass frame. Along with breaking the glass, the fall ripped apart the image, and left shards of glass in the picture's delicate emulsion. The image was carefully reassembled and chips of broken glass were delicately removed. Digital restoration included removing all the cracks and rips in the image. The color was also enhanced to it's original richness and contrast. A new large format negative was produced and enlarged to the exact dimensions of the original. 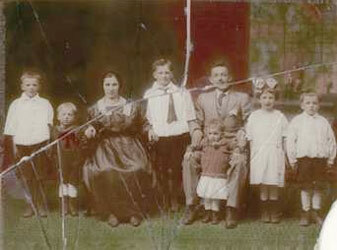 Select Photo Restoration in the above menu for more information on restoring your valuable photographs. Unfortunately many important family documents have not been properly stored and cared for. This seems particularly true for wedding licenses, school diplomas, birth certificates, baptismal and confirmation certificates and even Civil War documents. However even with the best of intentions older papers become brittle and the colors become dull and faded as they age. Fortunately, digital restoration can not only fix torn paper, but restore the color and detail to its original appearance. In this case the image was scanned, restored and printed on the finest quality archival 100% rag paper. Select Document Restoration above for more information on restoring your important documents.